If you notice that there are statistics incorrect, please send me a message with a screenshot to confirm that it is incorrect. Please, keep the feedback contructive! I would like to thank Patriot 777 for providing me with almost all the statistics, as well as Hawk 96 for providing some statistics as well. Very nice work Dave&Co. This is an excellent suppliment for the TankTastic Community and will definitely be useful for new purchases. Edited by basmal121, 27 October 2017 - 11:51 AM. Wery good work! It will be useful for both beginners and old tankmen who choose a new tank. And, it's will be good to post link for your database here, for russian players. [b]And, it's will be good to post link for your database here, for russian players. If that was intended as question, you may post it there as well. No problem. 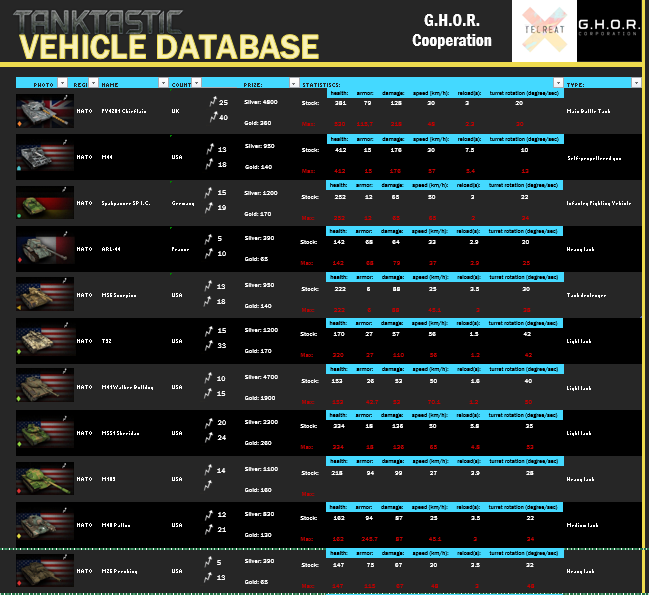 Not gonna lie this had been very useful for my tanktastic wiki editing past time, I'vee manage to update and add stats to a handful of vehicles without having to go into the game and check the stats of my vehicles or ask for the stats of vehicles I dont have. Though it is kinda a shame that some of the vehicles such as the PL-01 are missing info. Sadly that is the case. As I am not a tester, or someone with all vehicles maxed out I wasn't able to provide those as well, as I got the data from someone else. When I come back from my holiday I'll see to updating it. Oof, that means alot more editing for me when the more accurate stats are up. For now I guess I'll just put the speculated info that we already have as just placeholders to make the wiki a bit up to date and finished.